I know, I know. I skipped a week. But only because I was asked last minute to do a couple presentations at comic con and I needed the time to panic and writhe around on the floor gibbering like an idiot. But I’m back. And so is Scout. He’s trying the ol’ puppy-dog-eyes trick to get ahold of some frankfurters. Unfortunately, it doesn’t look like it’s gonna work. Guess he’ll have to come up with another plan. And before someone says, “Just have Bigfoot scare them away and steal the food!” …that isn’t really Bigfoot’s style. And it really seems like Scout’s lessons about playing it safe made an impact on the big guy. So we’ll just have to see if Scout can finesse this thing. 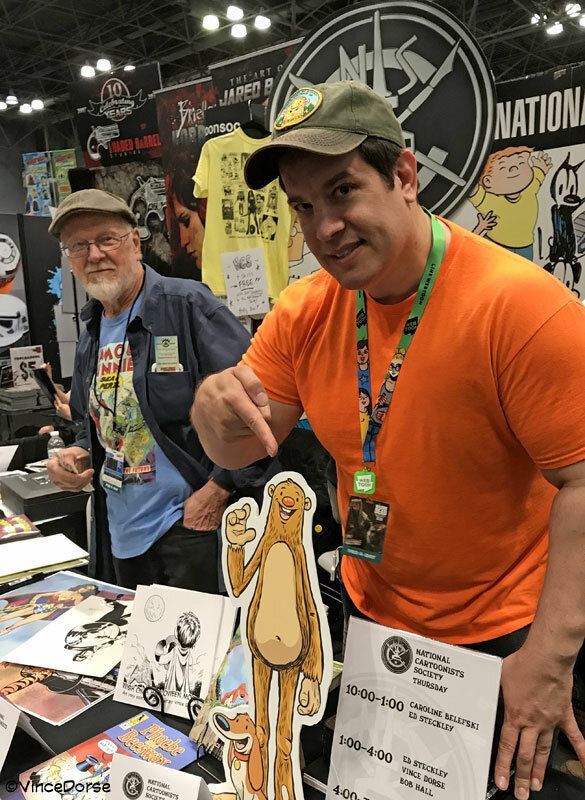 For the past few years I’ve gone to New York Comic Con and sat with the fine upstanding goofballs at the National Cartoonists Society Booth. A big thank you to everyone who came out to say hi (and buy books). You made my weekend. 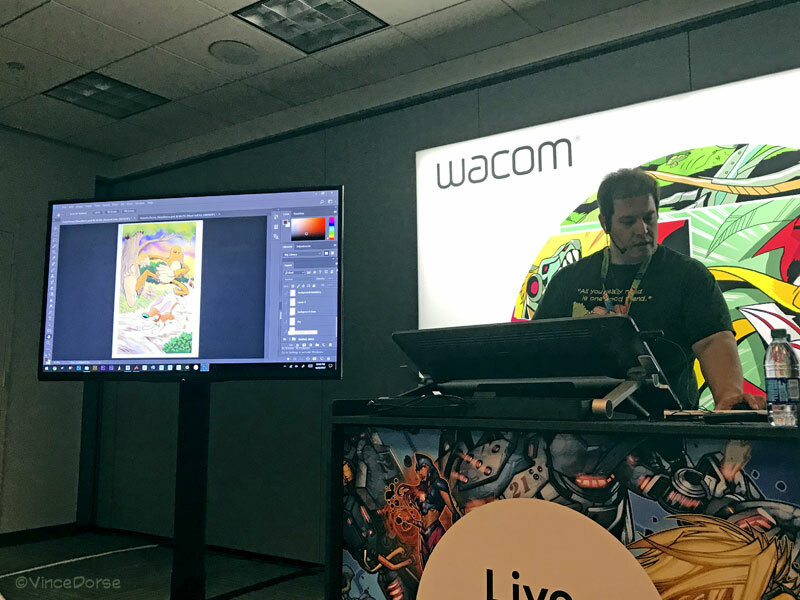 Jason Chatfield (Ginger Megs cartoonist and VP of the NCS) emailed me a few days before the con to see if I’d do a couple live demos in the WACOM booth, drawing for a small audience and explaining my process. Not something I’ve ever done but I’m always up for trying new things so I figured what the heck? Below is a gif of the image I used for the demonstration. I may end up making a nice poster print of this….I really like how brave and focused Scout and Bigfoot look. Like they’re on their way to perform some heroic feat. Ooh! Good name for Book Two: Heroic Feet! 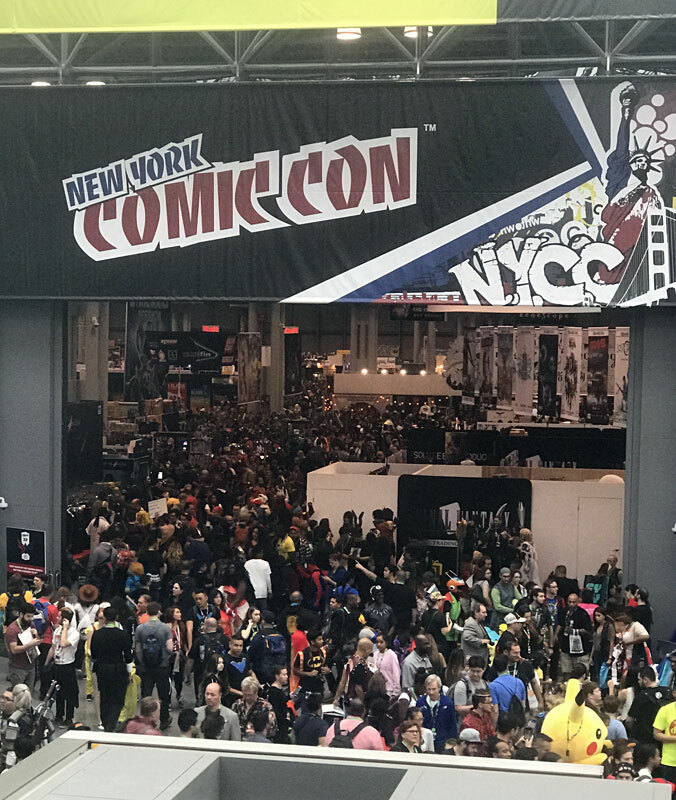 I’ll leave you with some images from the New York Comic Con. It was crowded, hot, and exhausting…but a whole lotta fun. And now that it’s done, let’s see if I can get back on track with this weekly comic thing. Opening day crowd was pretty crazy, but it got crazier as the weekend progressed. Craziest day was Sunday. They call it…kids’ day. Sitting next to (and drawing next to) legendary cartoonist and funny man, Arnold Roth. 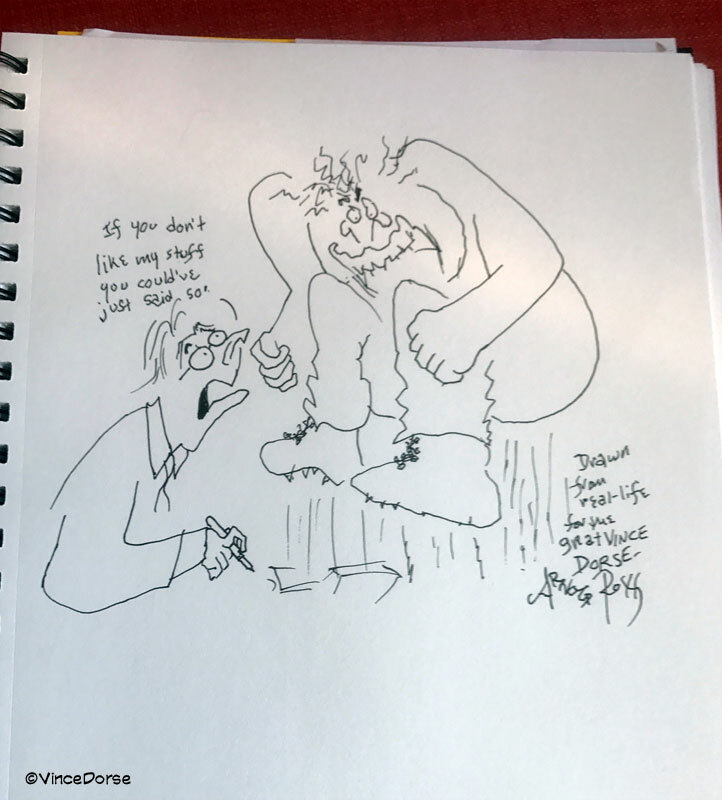 Arnie drew a gag for me in my sketchbook. It’s me and him, discussing his artwork. A priceless treasure. 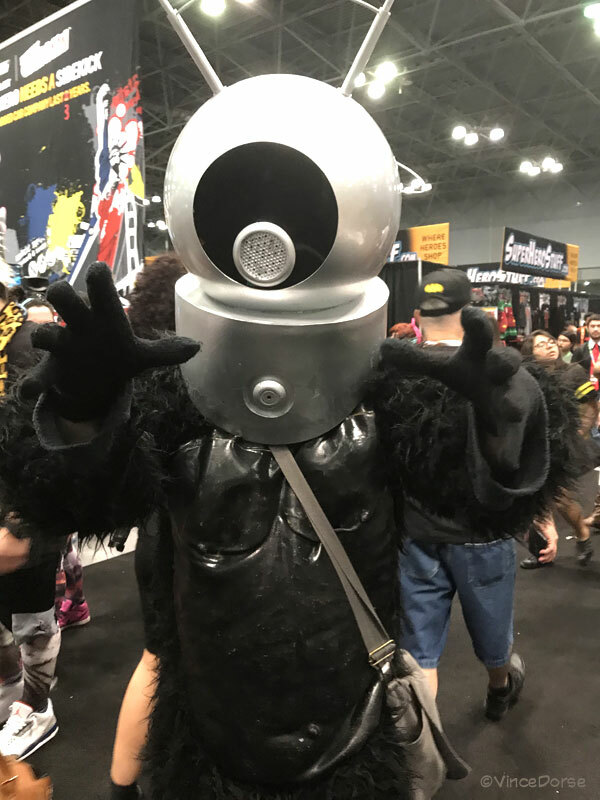 …then Robot Monster showed up. Ed Steckley (MAD), Jason Chatfield (Ginger Meggs, New Yorker), Ray Alma (MAD). 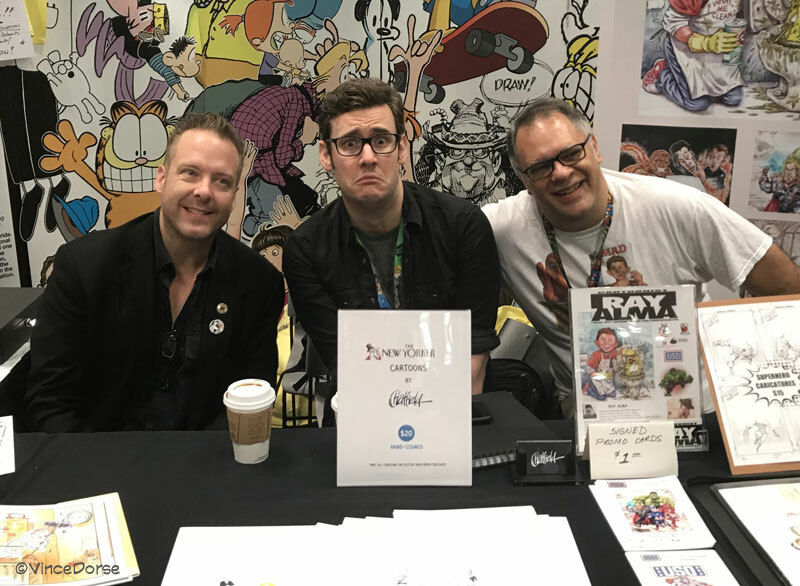 Just some of the cartoonists who manned the NCS booth over the weekend. …then The Comedian (from The Watchmen) showed up. 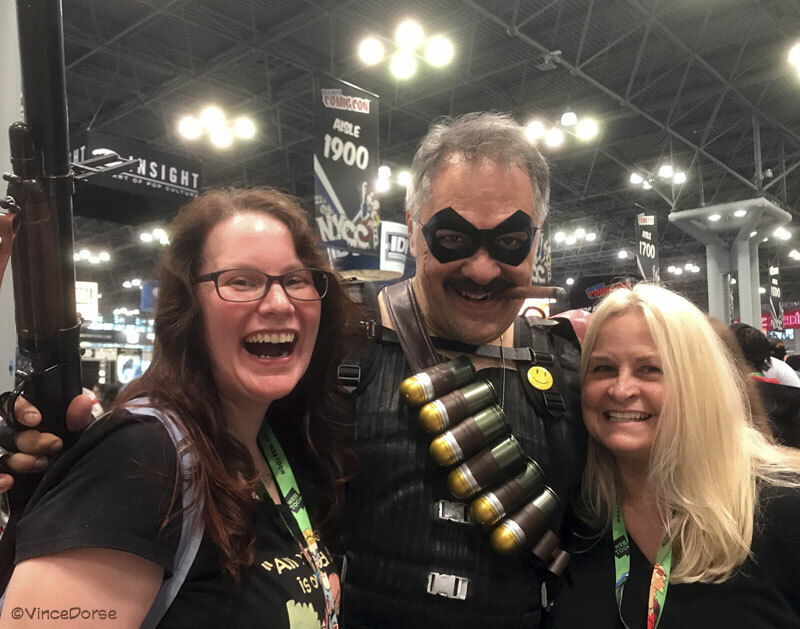 Actually, that’s cartoonist Ray Alma having a laugh with my friends, Michelle and Daryl. Me doing one of my WACOM demos. The headset mic made me feel very Janet Jackson. Author and friend, Matthew Cody. 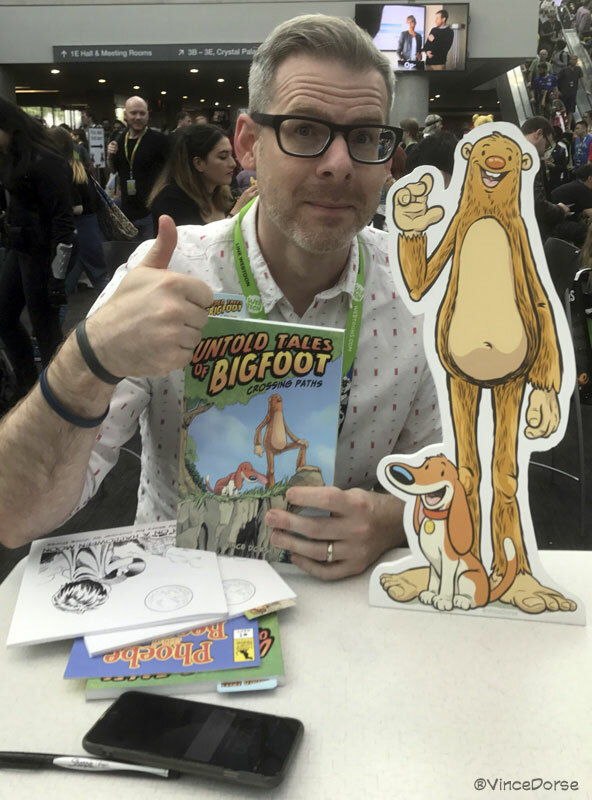 He wrote the kooky intro to my book, and he’s got another really fun trilogy of middle grade monster books coming out soon. 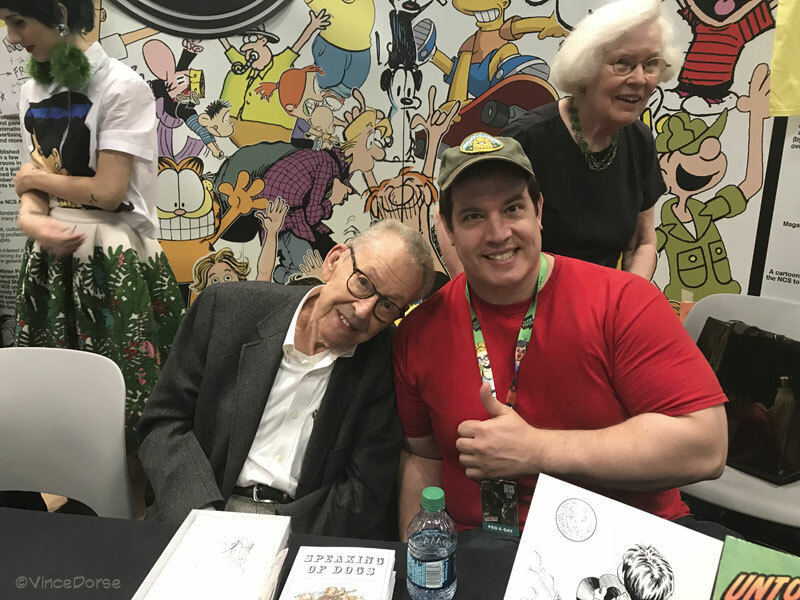 Comic artist (DC/Marvel) and writer, Bob Hall hanging out with me at the National Cartoonists Society table. So much fun talking shop with these guys. 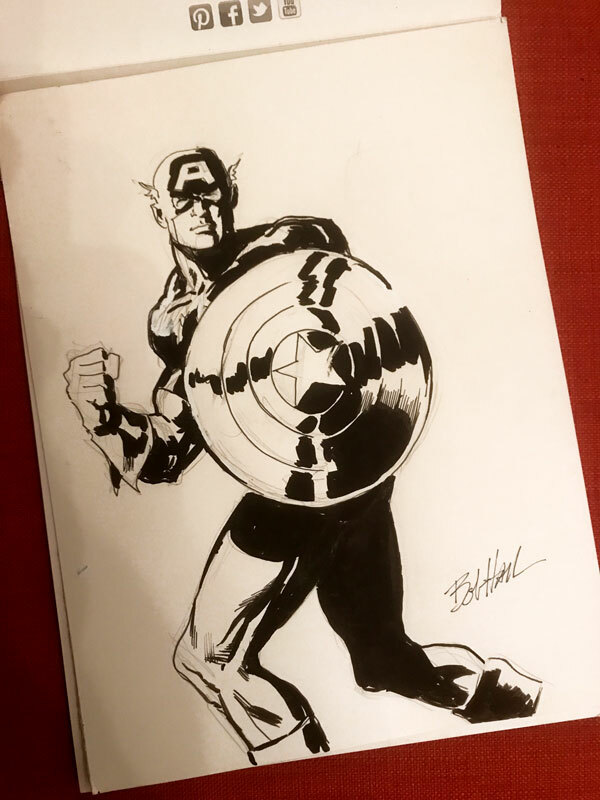 A Captain America Bob Hall drew for me. I did mention I got a bunch of cool sketches from the folks I sat with, right? What a great perk! …and then Michael Meyers showed up. 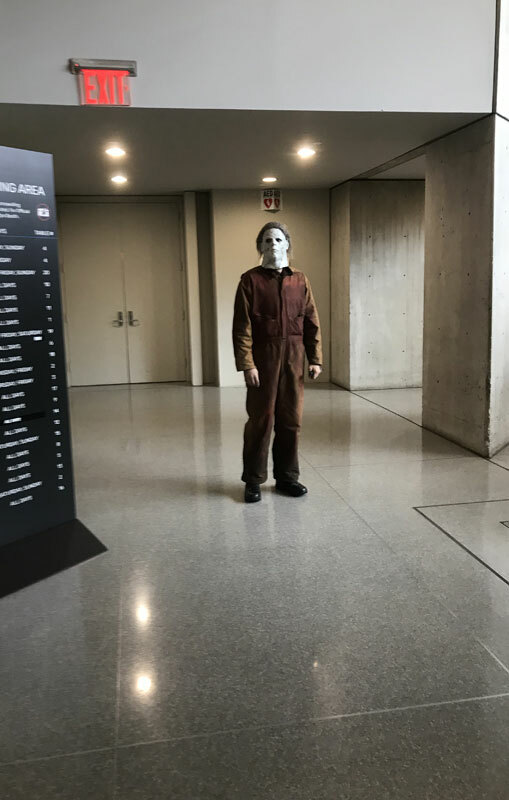 Oddly, in a packed convention center, we turned around to see this guy staring at us, the area around him mysteriously devoid of people. Happy Halloween!